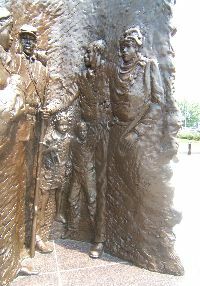 hatlie.de African American Civil War Memorial Washington, D.C.
African American Civil War Memorial Washington, D.C. 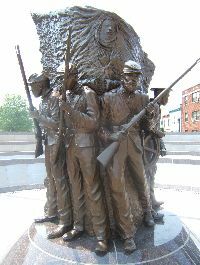 These pictures were taken on 19 June, 2006 in Washginton, D.C. right outside the metro station African American Civil War Museum. 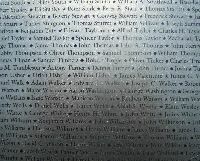 This impressive memorial is the first thing one sees when coming up the escalator from the trains. This is what it looks like from the metro exit. 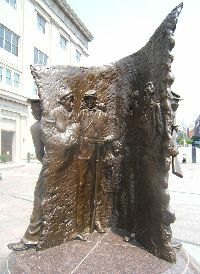 Here, as seen from further left. 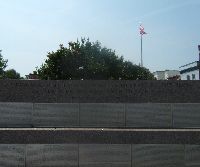 The pedestal makes it clear that the names listed are not those of the fallen, but of all those who served (for whom names are available). 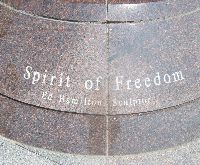 The sculptor was Ed Hamilton. 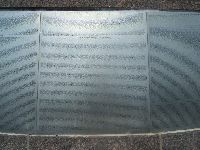 A small text on the lower right indicates that the piece was done in 1997, that one C. Robert Markert assisted in the artwork, and that it was produced by the New Arts Foundry. 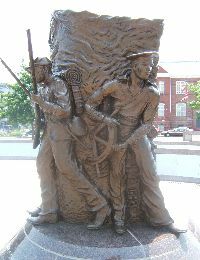 The large text along the back of the memorial reads, "Who would be free themselves must strike the blow. Better even die free than to live slaves. Friedrich Douglas, March 2, 1863." 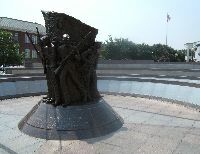 The over two hundred thousand names are listed on metal plates along the front and back sides of long, curved walls forming a semi-circle around the central statue. 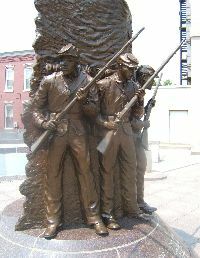 The names are listed by military unit. Most of the names have stars. Others have circles or diamonds. Those might indicate dead and wounded in battle.